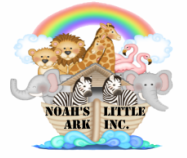 Reviews - Noah's Little Ark Inc.
"My son Lorenzo has been going here a little under a month now. And he LOVES IT! He's 2 and a half and is learning so much and talking so much more now ! He's getting potty trained by his 2 AWESOME teachers miss.Makayla and Miss.Melissa !! I'm so glad I chose NLA for his daycare!" "We love Noah's Little Ark! Our three year-old has been there since he was 12 weeks old. He loves his teachers, and we love the care and education he receives. He knows all of his letters and their sounds, and can count in English and Spanish. NLA is great!" "Both of my children went here for the pre-k program. I couldn't have been more pleased with everything they learned!!! My kids had fun and were happy. I really liked that I saw the owner or her family there everyday!" "We love Noah's Little Ark. The kids come home happy every day. We really like the staff and the atmosphere. They did a great job helping with potty training our toddler and our pre-k child has learned so much throughout the year!"